1. 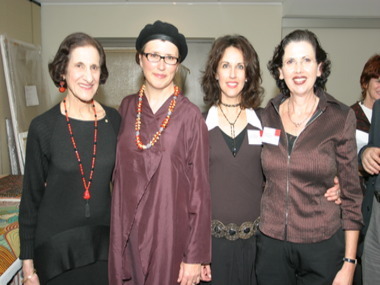 What was the inspiration for establishing the Shalom Gamarada scholarship? It came about some years ago when I gave a talk at the NSW Jewish Board of Deputies’ reconciliation and social justice plenum. A lot of my work at the UNSW involves working with people and letting them know some of the issues around Aboriginal health, so for me - this talk was one of my commitments to my work. There, I met Ilona Lee, President of The Shalom Institute, which runs the UNSW Shalom College. This quick meeting and chat initiated a process that rapidly took on a life of its own - I took a call a week later from the Master of Shalom College, Dr Hilton Immerman, who invited me to lunch with himself and Ilona and disuss a scholarship idea - that we organise an Indigenous art exhibition as a potential fundraiser. They put a $15,000 cheque on the table - and seed donation from a remarkable man - who (rightly) insisted that we work together as a group to provide a scholarship program for the students whole degree. We planned an art exhibition, featuring the work of Indigenous community artists, who would receive the wholesale price of their artworks, while part of the retail profit funds the scholarships. 2. How did the Muruc Marri Indigenous Health Unit and The Shalom Institute come together to launch this scholarship? Both Shalom Institute and Muru Marri Indigenous Health Unit are on UNSW campus. 3. How did you make the connection between medicine and art? What was the reason for funding the scholarship with an exhibition? For Aboriginal people, health is not just about the absence of disease. It is about how you feel in your heart, how you feel strong when you see your kids dance and speak in their language, and when you feel the presence and spirit contained in a painting. For the artists who contribute, it is about the utility of their work in enabling the programme to grow Aboriginal doctors and health professionals. For the students it is about the opportunity to live in on campus and focus on their studies. For us as a committee running the programme, it is about our responsibility to help grow a strong Aboriginal health workforce across medicine, optometry, health science (and soon) public health. It is about seeing a solution to the need for more Aboriginal students and graduates. 4. How has being involved in this scholarship programme impacted/changed your life? My word - how long is a piece of string. It has really helped guide me in my work - and see some fast 'wins'! With out this programme, I believe that the UNSW would not have as many Indigenous students as we do have today. In Shalom, we have a safe, friendly, culturally appropriate and academic environment for each and every one of the residential students. As more students enter University, there are some moving into their post graduate lives. It is seeing how people move through the system that encourages us all in making Shalom Gamarada happen. The programme would not happen without the significant input of our friends, family, peers, and colleagues, who - year after year - come along and volunteer large amounts of time to run this show. Such selflessness affects me - profoundly - I am grateful to be involved with such people - and learn every day that we have a lot, as a group, to offer. 5. What have you learned over the last 6 years in running this programme? If you have a good idea or thought - share it. And most importantly - CELEBRATE the wins. We had our first Shalom Gamarada graduate last year - Dr Beth Kervin. Beth graduated with two other UNSW Aboriginal medicine students. This year we have another graduate, and next year will be a number of graduates - it is all building up so that it no longer becomes 'unusual' to graduate Aboriginal health professionals, but the norm! Shalom Gamarada is part of the important story in the 'how' of building an Indigenous workforce. We have about 150 Aboriginal and Torres Strait Islander doctors out there, and about the same number again in training. It is not enough - but our programme, and the many other programmes around the country are making a real impact in the health and wellbeing of our peoples. 6. What continues to inspire you about Indigenous art? I love ALL Aboriginal and Torres Strait Islander art - no matter where it is from or whether it is 'traditional' or 'contemporary' in style. It is like dance, and song, and language to me. It speaks in a profound way - always telling a story - for some, one that is tens of thousands of years old - for others - one which is new and evolving. I love being a part of it - being in those rooms at the college when they are transformed is such a heart and spirit moving experience. I always feel energised and grateful for the chance. It is about health and healing, wellness and wellbeing. It is really hard to quantify my inspiration! 7. What changes can you foresee for the Shalom Gamarada exhibition and scholarship in years to come? I see that the programme will grow and become stronger. 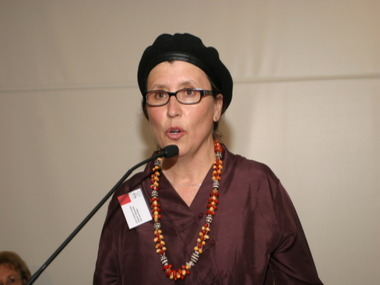 In 2010, the program offered ten scholarships that covered board and lodging at Shalom College, with three coming specifically from the exhibition, and another eight from other sources including — the Diramu Scholarship, the Sabina Ross Slater Memorial Medical Scholarship, the Gonski Foundation Scholarship, the Investec Scholarship, the Reuben Pelerman Benevolent Foundation Scholarship, the JCA Benevolent Scholarship Fund, the Judith Rich Indigenous Education Scholarship and the Bernard Hendel Memorial Scholarship. Each of these other scholarships came about because of the exhibition, it inspired people to come forward and say "I want to underwrite a scholarship" or "I want to give money directly into a scholarship". In this way, people are giving in a way which is meaningful. The annual value of each residential scholarship is $15,000, with some scholarships providing additional funds to assist the student with educational and living expenses - for example, lab coats, text books, stethoscopes, and HECS fees. In the first four years of the program, scholarships have been awarded to 21 Indigenous students, each of whom has a guaranteed place for the duration of their studies, provided they pass every year. We are getting better every year, and in time to come, I know our 'suite' will include scholarships and activities outside of these we have today!